Uh oh, looks like the TARDIS has been into the spiked egg nog again. She's a bit tipsy, but still celebrating the holidays in style! 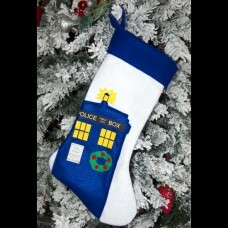 This parody "Go Home TARDIS, You're Drunk" stocking is a perfect addition to your Christmas decor, and well-made for stuffing full of gifts! Made of white and blue felt, this stocking measures a generous 17 inches tall, with room at the top for you to add your name. Colors are bright and vibrant. Personalization is available for an additional $7.00. Please choose your font style using the guide below, and be sure to double check the spelling of the name for any typos before placing your order. *NOTICE: This item is intended as parody. It is an individually hand made piece of art, and is strictly an artistic interpretation of an existing "Go Home TARDIS You Are Drunk" internet meme, parodying the TARDIS as being drunk. As such, it is not licensed by any entity. No connection to any other entity is herein stated or implied. "TARDIS" is a trademark of the BBC.